Circa 1256 / 1258 after completing his zahiri ilm, (external sciences of religion) including the commentary of Quran, Hadith, Islamic Jurisprudence and other knowledge such as mathematics and astronomy, Muhammad bin Ahmad Bukhari was living at a quarter of a Mosque in the east of Delhi. In another quarter there lived Najibuddin Mutawakkil, brother of Hazrat Fariduddin Ganjshakar, who was one of the great Sufi Master of that age and the spiritual successor in charge of Hindustan. Soon Muhammad bin Ahmad became friend with Najibuddin and it was him who informed Muhammad bin Ahmad about the greater Sufi Master Fariduddin Ganjshakar, his role as someone who train his disciples about the inner sciences of the Path. For sometime now Muhammad was looking for more than the knowledge confined within the pages of Book. His heart was feeling the yearning to meet someone who could help to reach beyond the ordinary and common knowledge. After completing the external sciences he was looking for someone who could help him attain the internal sciences, who could recognize God and reach God. Perhaps it was Khwaja Ganjshakar he sometime thought and he was looking for an opportunity to meet him. One day just before the Dawn prayer there was a recitation of the Quran which reached Muhammad bin Ahmad, not only his ears but to the heart of his heart causing great revolution in his being and his life changed for him, for ever. Has not the time arrived for the hearts that securely believe to submit themselves to the remembrance of Allah and what has been revealed of the truth? (The Quran 57:16). Hearing this verse was enough for the volcano within his heart of heart to erupt. His inner being spoke to him, "Enough time has passed already. You have only roamed on the surface of the ocean of knowledge, but have neither reached its depth nor have collected any of its precious pearls. If you want to obtain them, then look for a suitable master who will teach you how to dive well. Otherwise your life will be a waste." Muhammad ibn Ahmad, who was later to be famously known by the name Nizamuddin - his journey started at that blessed dawn. After his morning prayer, in the Name of Allah, he started towards the door of Baba Fariduddin who used to live at Ajodhan (the present Pakpattan, Pakistan). Muhammad bin Ahmad Bukhari was born in 1238 AD into a blessed family which traces back its family tree to both Imam Hasan and Imam Hussain, the two grandsons of Holy Prophet. The great grand father of Nizamuddin migrated to Indian sub-continent from Bukhara, Central Asia. Both his parents were of pious nature. Unfortunately Nizamuddin lost his father early in his age when he was only five. Nizamuddin's mother also died when he was young. At the moment of her death, he took the hand of his son and said, “I am leaving you to Allah’s care,” and those were her last words. Later on Nizamuddin said, because of her mother’s surrendering her son to God: “These words of my mother gave me so much happiness that even if I were given a palace made of pearls that would not match my happiness.” It was perhaps the acceptance of these words, God literally prepared him for the great spiritual and humanitarian work that was done by him, which continues even until today, some seven hundred years later. “Baba Nizamuddin! Wake up! We are guests on this day in the House of God (Allah ka Mehman)!”. And she used to glow with joy, and her hands were warm while she lifted me and held me in her arms. It was my mother who initiated me upon the path of trust and joy, who liberated me once for all from the slavery to the seasons and the conditions of this world. When he reached at the Darbar of Fariduddin Ganjshakar, who was a Master who have attained Kamaliyat (spiritual perfection), he recognized the inner reality of Nizamuddin at the first glance. Soon Baba Ganjshakar remaked: "My son, my life in this world is almost over. For sometime I wanted to entrust the wilayat (domain) of Delhi to someone else. When you were on your way, I heard a voice instructing that I should wait as Nizamuddin Badayuni has been sent to me; he is fit for this domain and it should be entrusted to him. So stay in our company so that after completing your inner training, we will appoint you as our Caliph and as the Wali-e-Hindustan (Saint of India)." During initiation Khawaja Ganjshakar said, "From this day I am giving the belayat / wilayat (spiritual domain) of Hindustan to you. Devote yourself to work. For that it takes great preparation. Come I shall teach you now." 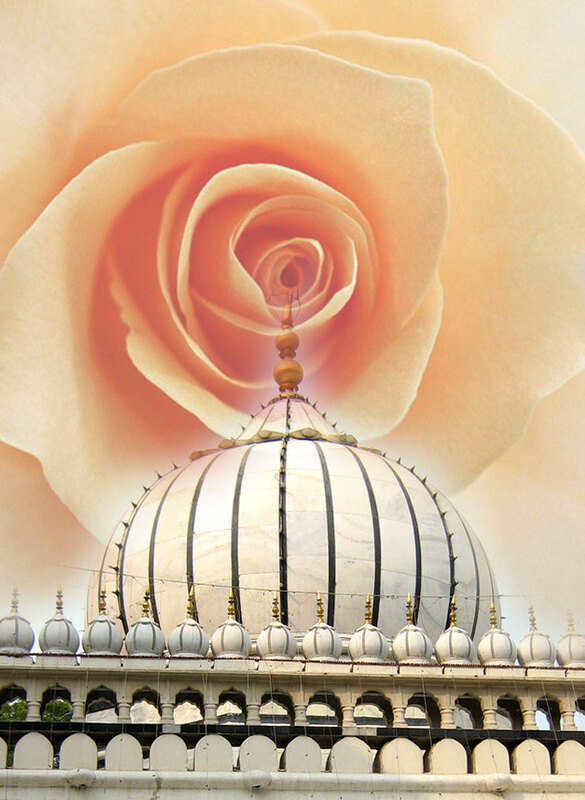 The Chishti Order is famous for its emphasis on love, tolerance, and openness. Chishtis are also famous for incorporating the practice of listening to Spiritual Music as a mean of attaining Godly realization. This is called the practice of Sama, evoking the divine presence through song or listening to music.The genius of the Chishti saints was that they accommodated the practice of sema with the full range of Muslim obligations. After receiving initiation in the Sufi Path, Sadhana or great spiritual exercise and preparation began. There can be no lapse, no heedlessness. The sadhak, the true seekers of God, the sincere seekers of Truth do not run after the pleasure of the material world. Without high spiritual discipline none has prepared for the Way. His Spiritual Master Ganjshakar lived an utterly simple life and their devotion to God and practice of remembrance was so intense that they would go on without food and water for days and nights. At the place of Ganjshakar, Nizamuddin and his other spiritual traveler also devoted themselves into serious practices. Those who have purified themselves to attain Godly realization at the Spiritual School of Fariduddin Ganjshakar, they all attained through very rigorous struggle against the self. Their food were Remembrance of God, their sleep was their meditative states. They ate so little and so less frequently that it would dumbfound common people. This was also the inner and outer reality of their lineage Master Holy Prophet, the Messenger who also ate very little and sometime would go on fasting for days after days. The real Sufis mystics never deviate from the Way of the Holy Prophet and would embrace his way of Zuhd (renunciation of the materialism) - a quality so much lacking in present day. The Holy Prophet would initiate certain disciples of higher spiritual aspirations never to ask anyone for anything. This was their promise on the bayah, never asking anyone anything except God. This was a practice of living spirituality in which training is attained on Tawwakkul, complete dependence on Allah. Thus according to the teaching of Tawwakkul, a Sufi must never ask for anything to anyone, neither favors, nor wealth, or food. Thus one of the definition of Sufis has become, “those who possess nothing and who are possessed by nothing” or said in another way, “those who have nothing and want nothing.” Just as an infant knows only her mother and all her wants and needs are expressed to her mother and no one else, similarly a true human being, who is the children of God must be like an infant who completely surrender and depends on God. This is also the manifestation of the teaching of Christ who used to say, “Unless you become like children you can not enter the Kingdom of God.” Practical spirituality of the Sufis teach this by not being dependent on the creation, not to ask anyone for any favor or wealth, money or food. At the Darbar of Khawaja Ganjshakar, every dervish used to receive their spiritual training in utter poverty, poverty only from materialistic point of view, but in truth they were richer than the kings of the world and even until these days people of opulence turn to them for help. Many days used to pass by when they didn’t even have anything to break their fast except water. Hazrat Nizamuddin and other disciples, some would go to collect fire-wood in the jungle, some would collect water from great distance, some would cook for the rest. 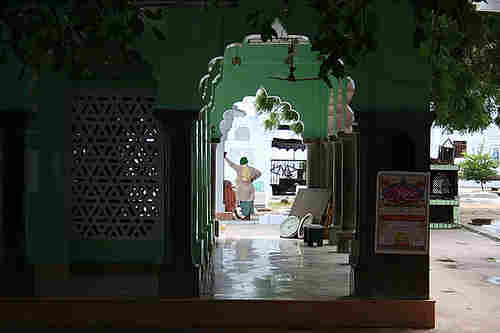 Shaikh Nizamuddin often fasted, and always ate sparingly, usually no more than a small loaf or portion of bread at iftar, with bitter vegetables or rice. At meals he would offer morsels from his plate to everyone else at the table; he might take a bit of rice, but never touched the meat. When asked whether he was satisfied by what little food he ate, the Shaikh answered, "Well! I could eat one more bread, but I do not." One day a visitor to the khanqah, seeing the quality of food served, asked to dine with the Shaikh himself — certainly the menu of the pir would be extraordinary! So he insisted on eating only what the Shaikh ate. The Shaikh and his dervishes tried to discourage him, warning that he would surely regret his decision, but were unsuccessful. Though a generous spread was laid, the Shaikh did not partake of it. At last, after the dervishes and guests had eaten their fill, the Shaikh invited his guest to sit. A bowl of bitter greens was set before them. Nizamuddin picked out the toughest roots and stems for himself, and offered the tastier leaves to his guest. Stunned, the visitor asked if any other dishes were to follow. The shaikh replied that this was all that would be served; he had invited him only because he had insisted. The guest tried to eat but could not. In the end he left the dargah in great humility and respect. During winter sometime he would say, "O Allah, so many of your unfortunate servants are enduring in this winter" and in saying he would weep out of love and compassion for them. One day while Nizamuddin was serving his Teacher, Baba Fariduddin said, “My son Nizam, May Allah have mercy on you. It has been inspired to me that soon you will take leave from here. Allah has raised you to the level of realization. So listen: always fast, because fasting keeps the lower self in control. It is through fasting that both body and soul remains in protection of Allah. Allah save him who fast from the whispering of the evil beings and from their misguidance. And listen, salaat (muslim prayer) is like miraj for mu’min. So those who wish to meet Allah, for them salaat is the vehicle. To pray five times a day is obligation upon all believers, so always achieve them. But for the lovers of God, more is demanded. So pray voluntary prayer as much as you can. It is because Allah becomes very happy with voluntary devotion of His servants. After this is Hajj, the pilgrimage. Hajj obliterate all sins of man. Allah Himself is the bestower of Garden to His servants. He then said: “When you return to Delhi, do not waste a single moment. Always attach yourself to contemplation and meditation. Remember, the moment we waste, we have to be accountable to God for that. Do not be without the remembrance of God for a moment. None can be sure of the amount of time one has left before death. When the angel of death arrives for us, we never know. God forbid, if we die in those moments where we are absent from remembering God, think how much ashamed we would be to present ourselves to God? Then after a little pause he said, “Son, God’s kindness is vast. There is none equal in generosity of giving than Him. Whoever asks to Him, receives. Be careful, never ask to anyone for anything to gain. Whatever you need, ask from Allah. I am praying to Allah for you. Whatever you may ask Him, you will receive. Remember, tawakkul (dependence of God) is destroyed by asking to people. Besides, what people have really that they may give to you?! The Kingdom is God’s, everything belongs to Him. He gives whomsoever He wills, and withholds from whomsoever He wills. Whatever is stored for you, you will surely get them. No power can take them. Then he again said: “Remember another special secret. He who has Allah, has everything. If you can please Allah, you will neither have any need of this world or the hereafter. If you are in the Path of Allah, Allah will bend people’s heart towards you and you things will appear at your door even without asking. Hazrat Nizamuddin received the highest art of spiritual training in the company of his Master, Hazrat Fariduddin Ganjshakar. During this time her served his Master in total dedication, spending most of his time in prayer, remembrance practice (zikr), meditation (contemplation), moshaheda (witnessing), recitation of the Quran and reciting litanies. When inspiration descended to Hazrat Fariduddin that Nizamuddin is close to attaining spiritual perfection, he felt happy and sad at the same time. Happy because he has attained and have become an worthy disciple, and sad because now he has to be sent to the world to be a light unto others. So one day he called Nizamuddin to his side and said, “My son, even if I want, I can not keep you any more with me. You have finished your ask. Allah the Most Great is pleased with you. Now if I do not allow you to serve humanity, Allah will be displeased with me. Listen, Allah has given two things in front of man. One is this temporal world and the everlasting Kingdom of the hereafter. My desire is that you work for the Kingdom of God. Foolish people have rejected the refuge of Allah and have accepted the temporal world. They are approaching Hell fire after being seduced by the Devil. There is a need to give them guidance. May you be inspired to call people of Hindustan to the noble Path. After this Baba Farid called his dervishes and addressed them: Know that today I am giving the Taj (Honor) of the Sufis to Nizamuddin. Hearing this Nizamuddin lowered his head in humility and began to cry. Baba Fariduddin consoled him saying: Do not fear my son. Ask help in every action from Allah, He will be your help. After this Baba Fariduddin gave him the turban that he received from his own Shaykh Hazrat Qutubuddīn Bakhtiyār Kākī. He then gave him the khikah (coat of the Dervish) and the staff as well. After this Hazrat Fariduddin asked him to pray two cycle of prayer of gratefulness. Then he made him stand facing the Qibla (towards Mecca) and pointing to Heaven with his finger, Baba Farid said: "Allah, I am surrendering Nizam to Your hand. May You help him in every affair." Hazrat Baba Farid, said to him on appointing him as his successor, "Be like a large tree so that Allah's creation, the human beings in their vast multitudes, may find rest and solace under your shadow." This partly explains why he admitted so many men into the Chishti order as his disciples. Hazrat Nizamuddin also sent his well-versed and caring disciples to far-flung areas of Uttar Pradesh, Rajastan, Gujarat, Bihar, and Bengal amongst other places to spread the word of truth. Master Nizamuddin later said, "After I was given the responsibility, I remained in the company of my Master for only two more days. Before parting he called me to him and said, "My son, Allah grants three gifts to His servants: 'Ilm or knowledge, Aql or intelligence and Ishq or love of God. Most people don't receive them at the same time. This is a special gift and Allah have bestowed you with three of them. It is your duty to pay respect to this gift. Baba Fariduddin further adviced him: "Baba Nizam, when you will find two task has been imposed simultaneously upon you, one of the Deen (the Path) and the other of the world, then given preference to the work of the Deen. Love the creation of the Creator. Even if they behave rudely towards you, do not be displeased with them. Consider them kindly as someone who have not matured in understanding. There will come a time when great opulence and wealth would beg you to be yours. But becareful, do not fall into the attachment of delusions. Remember, the Devil come in many disguises to capture human beings in its gang. Sometime it comes in the disguise of worldly wealth, sometime as position and power, some time as immoral relations and sometime even in the disguise of pious people. Common folks can not recognize the Devil and hence get caught into its net. Allah has given you knowledge and conscience. Whenever you will feel the work of Devil in any work, always leave it by saying, "la haowla wa la quwwata illa billah." There is no power and might except that of Allah. Never do that which give rise to suspicious in your heart, never eat that which create suspicious in mind, never accept money that you have suspicion on its purity. I am giving you to the hands of Allah. He will help you in every affair." After this Nizamuddin bade farewell to his Master and began his journey to Delhi. Shortly after that when Nizamuddin returned to Delhi, he received news that Baba Farid has returned to the Lord. At first Nizamuddin settled back to his old city Delhi. But soon by the blessing of his Master, many people came to visit him, to talk to him, to receive his blessing. Most of the time, day and night he used to give counsel to people. He longed for solitude, but kept at serving people. He felt uneasy at heart and one night while immersed in meditation he heard the voice of his master, "Nizam! Take heart! Every day from morning till night prayer he would live among people, then at night he would retire into a jungle and pray and recite the Quran. Such great was his voice that even animals of the jungle would come and listen to his voice forgetting their food and drink. After residing in Delhi for a few days, he disdained the crowds of people and desired to withdraw himself to total solitude. He then received a Divine inspiration that his place of residence should be Ghyaspur, a small village outside the city of Delhi. After residing in Delhi for a few days, he disdained the crowds of people and desired to withdraw himself to the desert. He then received a Divine inspiration that his place of residence should be Ghyaspur, a small village outside the city of Delhi. First he had built a temporary shed with a straw roof for himself and all his companions. After some time, a better place was constructed for him by one of his disciples. Hazrat Nizamuddin Awliya lived here for more than sixty years and never changed his place of residence. The Khanqah is still there and is visited by many people up to this day. After passing the spiritual status of Ghawsiat (reaching the status of a Ghaws), Hazrat Nizamuddin reached the status of Mehboob (beloved). His personality was a container of divine secrets and his intentions were in harmony with those of Allah. 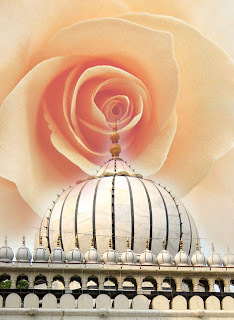 Hazrat Nizamuddin Awliya is known as Mehboob-e-Elahi, the beloved of Allah. The spiritual status of a beloved is much higher than that of a lover. He had more than 600 khalifas (a khalifa is a disciple who is given the authority to take his own disciples and thus propagate the spiritual lineage) who continued his lineage all over the world. Hazrat Nizamuddin Awliya experienced great poverty at Giyashpur where he settled. Many days would gone by where he and his dervishes would not have anything to eat. The water of river Yamuna was their only nourishment before and after fasting. But their main food for the soul was the remembrance and meditation of God. He and his dervishes one day was without food for consecutive four days. During that time one day a pious lady brought some barley flour and presented it to him. Nizamuddin asked one of his disciple to boil it in a cauldron. At that moment, a faqir (mendicant) with a patched frock arrived and with a loud voice said, "O Nizamuddin! Bring whatever is present." It was said to the guest that the food will be ready soon, but the faqir was impatient. He said, present to me now whatever is there. So while the food was not finished yet was brought to the guest. The mysterious fakir placing his bare hand into the fiery hot food begin to eat. He was given everything despite Nizamuddin and the Dervishes were starving. After finishing all the food from the caluldron the faqir did something amazing. He smashed to broke the cauldron. Hereafter he said, "O Nizamuddin! You have received the bounties of the invisible world from Baba Farid, and now I have broken the bowl of visible poverty. Now you have become the Sultan of both the visible and invisible world." From that day on, by the grace of God and through this mysterious guest, countless gifts started arriving and free food was distributed to hundreds of visitors every day. Hazrat Nizamuddin Awliya was very generous. Every day whatever the large numbers of gifts they received, they were distributed before the evening. More than three thousand needy people used to live on the Langar (food distributed openly to all who visit). he was so generous during his life time that no would would be refused for their wants, be it material or spiritual. Although large stores of food were needed to feed the stream of guests, the Shaikh wished to cultivate an atmosphere of tawakkul (trust in God) and acceptance of God's will. Therefore, food was distributed almost as soon as it arrived, and the stores were swept and cleared out every Friday morning. This practice of serving food to hundreds of people still continues till today. Allah holds dear those who love Him for the sake of Human beings, and also those who love human beings for the sake of Almighty Allah. If a man places a thorn in your way and in retaliation you do the same, then there will be thorns everywhere. It is better to forgive than to subdue one's anger, for without forgiveness the repressed anger may become the cause of jealousy and revenge. On the Day of Judgment nothing will be subject to greater interrogation than once ability to provide solace to broken hearts. To hurt a human heart is to hurt the grace of Almighty Allah. d) Purity of inner self from all worldly things except Almighty Allah. The morning of the truthful appears in the morning; the morning of the lovers starts from the Isha salat (night prayer ) till the salat of fajr (early morning prayer) and they stay awake in the whole duration. This is quit common that people reciprocate good behavior with good, and bad with the bad. But the Auliya - Allah, i.e., dervishes are good with the good but also good with the bad. Nizamuddin died on April 3, 1325, leaving behind a line of khalifas (disciples) best-known of whom were Amir Kusrau, the famous poet-mystic and Nizamuddin Dehlavi, the successor of the saint. In the manner of many great saints, Nizamuddin foresaw his own death and prepared his followers well in advance. At the age of ninety one, Hazrat Nizamuddin fell seriously ill. Allah send the glad tidings of the appointed time of death for the Auliya (saints) and Prophets and Messengers ahead of time. When his disciples, during his illness requested that may he ask Allah to give him longer life in the world so that his disciples and visitors may benefit from him more, Hazrat Nizamuddin replied, "My yearning to meet my Lord has increased so much, I do not have the desire to stay here even for a moment." Upon hearing this, his disciples begin to week at the thought of separation of their master. Then they asked for his instructions, and he said at the final prayer on my body after death, arrange a 'Sama', an audition of divine Music. Such was his love for Sama. Until this day at his final resting place, Qawwali is sung. Union with You - what else can I seek? For 40 days before his death, the Sheikh ate nothing. Shortly before his death, Hazrat Nizamuddin called Khadim Iqbal and said, "Whatever cash is present, bring it so that I may distribute it to the deserving." Iqbal replied, "Whatever gifts come, they are distributed on the same day. But there are a few thousand tons of grains in our storeroom." “Bring it out and distribute it to the deserving," said Hazrat Nizamuddin Awliya. After this he looked for his clothes and gave some to his dervishes, to his successors and few others he distributed to the poor. He gave his special gifts that he received from his master to his successor Nasiruddin Chiragh Dehlavi. Then he performed his afternoon prayer and just before the sunset became veiled into his Lord. Thus is the way of the Saints. As true human being, they come to this world empty, free of any attachment and when they leave, they leave without any possession or attachment to wealth and distribute all as a testimony to the truth that "Everything in the heaven and the earth belongs to Allah." Inna lillahi, wa inna ilaihir rajiun. Indeed we are Allah's and to Allah is our final journey. By the Secret of al-Fatiha! May Allah bless the soul of Hazrat Nizamuddin Auliya and raise his rank and may Allah bless all his disciples and lovers. May his soul and the soul of all the elect servants of Allah continue to receive Divine grace till the end of time.